Jim and I made these cookies to take to an open house party and a bachelorette party this weekend. They were such a hit that Jim made a second batch the next day. We tweaked the preparation and ingredients only slightly from the author – Cooking Classy , original recipe here . In a medium mixing bowl, combine caramel sauce, remaining 1/2 tsp. vanilla extract, and remaining 1/4 cup butter. Combine with a hand mixer or stand mixer until smooth. Slowly add Confectioners’ sugar and mix until smooth. 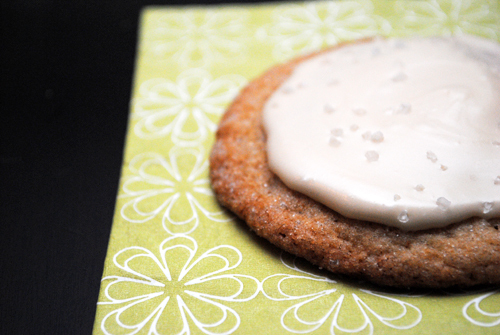 Working with one cookie at a time, use an angled spatula and frost cookie with approximately 2 tsp. of frosting. 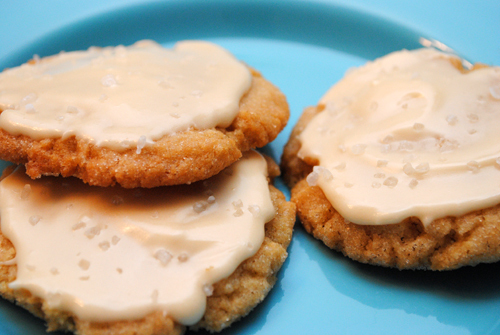 Immediately sprinkle the cookie with coarse sea salt so the salt sticks to the frosting – salt lightly, a little on each cookie is all that is needed.